All mammals (including dogs, cats and humans) have numerous beneficial bacteria living in their digestive tracts (gut). 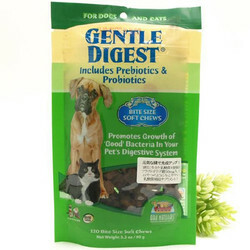 Gentle Digest contains prebiotics and probiotics. Probiotics provides a source of beneficial intestinal bacteria and also helps to encourage their growth. Prebiotics help stimulate the growth and - or activity of probiotics.Gentle Digest is helpful for numerous issues including:antibiotic associated diarrhea, constipation, and irregularityoccasional bouts of gas periodic outbreaks of ear yeast infectionAiding senior pets who have difficulty absorbing food nutrientsMaximizes benefits for pets fed a raw dietMade in the USA!